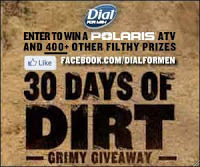 Go here to “Like” Dial for Men on Facebook and to enter to win the 30 Days of Dirt Giveaway. The daily prizes include Dial for Men products, $50 gift cards, and Dial for Men T-Shirts. You can enter every day until April 20. Let me know if you win!